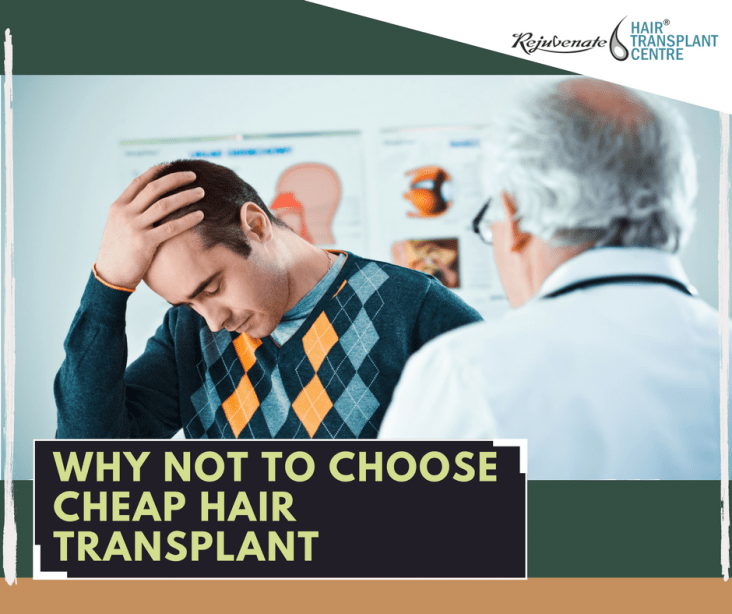 Why Not To Choose Cheap Hair Transplant? Hair Transplant is the surgery which you want for your pleasure, to add to your personality, to gain your self-confidence. If you will not get good result of it then not only you feel cheated in terms of money but it will also hurt you deeply. Before going for hair transplant the most common question is the cost of hair transplant, there is a lot of advertisement telling Hair transplant @ Rs 1 or Unlimited hair transplant @ 50000 Rs. Such type of advertisements is misleading and you may get trapped for cheap hair transplant. One thing should be very much clear in your mind that hair transplant is a very demanding surgery; it needs dedication of the surgeon as well as the team doing it. We all know that for everything there is a cost and cost depend on many factors. Like qualification and experience of the surgeon, a team of trained assistant, a clinic where the procedure is done is well equipped or not. Although hair transplant is a safe procedure sometimes there can be complications or some allergic reaction. Surgeon shall be qualified and trained to manage it. Qualification and experience of the surgeon is the key to get successful hair transplant surgery. Hair transplant in India can be done by Plastic surgeons and any other surgeon with proper training of hair restoration. It cannot be done by dentists, Ayurveda or homoeopath doctors, you should inquire for it before going for hair transplant, it should be very clear to you who are going to operate you and what are his previous results. At Rejuvenate Hair Transplant Centre both of the surgeons are well qualified and are the Diplomate of the American Board of Hair Restoration Surgery. A dedicated trained team is the one who works as a full-timer with the surgeon, and it involves cost. You should also inquire about the availability of the team members and their qualification. Well equipped Hair transplant Centre is the last but not the least requirement for a good hair transplant procedure. It should have all the facilities to deal with emergency conditions. Unnatural Hairline – very low or like doll ‘hair giving it ugly look. Very Low Density—Maybe because of damage to the hair roots, all transplanted grafts not able to grow. Damage to transplanted roots also reduces the diameter of the hair grown from it. Folliculitis – severe itching and even infection may take place if proper hygiene is not maintained during the surgery. If blood vessels get damaged than necrosis may occur in the donor area or in the recipient area, so there will be the loss of precious permanent hair follicles and time as well as the money you spend is wasted. So going for a cheap hair transplant is actually become more expensive.